Your Partner for HR Assessments! Increase your confidence in your human resource practices with the employee personality and cognitive ability reports from Hogan Assessments. The next-generation tool for the assessment and development of leaders. Well-designed assessments can provide awareness, which can lead to well targeted actions that can improve performance! Choosing the right person for the job is the first step toward building an effective organization. 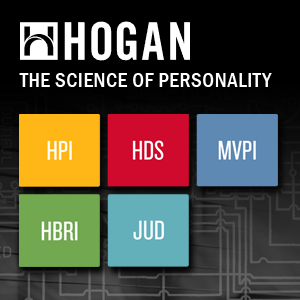 Increase your confidence in hiring with the Hogan Assessment Systems suite of products. These assessments determine how close a candidate’s characteristics, capacity and drive match the job. Improved employee relations begin with listening, understanding and analyzing results from scientifically designed surveys. We offer customize designed as well as standardized employee surveys in a variety of areas. The most popular are the Employee Opinion, Change Readiness and Organizational Culture and Climate surveys. Helping individuals perform to their potential is a large part of organizational success. Our self and 360 assessments promote individual growth and development. We offer certification workshops for Hogan and Clark Wilson Group products. Decades of data from our surveys is available for your own analysis and initiatives for a comparison of where your organization ranks among similar businesses. Norms can be customized by industry and company size. Boston, MA: August 20-21, 2019 ! Onsite Hogan Certification is also Available !